A solid match for the GOAT here as he defeated Tommy Robredo in straight sets to avenge his loss to the Spaniard at last years US Open. 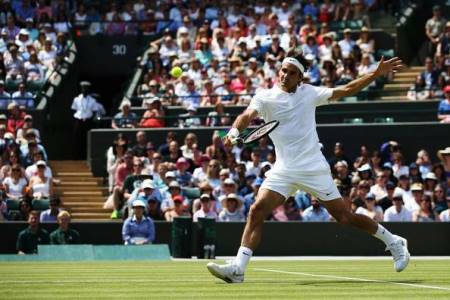 It was another fantastic serving display and Roger has yet to drop serve in all 4 matches, making him the first person ever to reach a Wimbledon Quarter Final without being broken. Obviously Roger had some unfinished business after his pitiful 4th round loss at the US Open against this guy and I think it was an impressive win. Precision serving, very nice forehands and the backhand worked well. Robredo isn't known for his grass court game and he was outclassed in all areas. Job done. The first game set the tone as Roger kicked things off with a serve and drive volley on the very first point. Two beautiful forehands followed and Roger's side of the scoreboard was up and running. Things got even better in the next game as Fed got an immediate breakthrough; Robredo saved 3 break points but couldn't hold off the 4th as he slipped down 2-0. More good serving from the Swiss followed and he then secured the double break for a 5-1 lead before serving out the set to 15 to hand the Barcelona native a breadstick. The second set saw more of the as Roger broke Robredo immediately before holding for 2-0. That was soon 3-1 and a joke smash from Robredo gave Fed another chance to break serve but the Swiss couldn't capitalise. It didn't matter though as Roger steam rolled through his next service games to take the set 6-3. He didn't lose a single point on serve the entire set. Pretty crazy and it was one of the most dominant serving displays I've seen since Nadal vs. Murray at the French. As we all know Roger often takes his foot slightly off the gas in the third set and he did so again here. That allowed Robredo to find more of a groove and he began to play better from the back of the court. It mattered none though as it only brought the players just that bit closer together rather than shifting momentum completely. After trading 3 service games each Roger finally got the breakthrough to lead 4-3. He consolidated before saving his first break point of the match when successfully. Game set match 6-1, 6-4, 6-4 in just over 90 minutes. Again not a huge lot to say about this match as Roger was able to dominate from start to finish. Once he gets off to a good start on grass he his very hard to stop. He can cruise on his service games which puts the pressure on his opponents serve giving him plenty of chances to secure the break. Granted Roger has had a relatively easy draw so far but to not be broken in four 5 set matches is very good going. It's never happened at Wimbledon before so that's all you need to know. The forehand was looking good today too, contributing a large chunk to the winners column and it kept Robredo way behind the baseline. Unlike the US Open 4th round encounter Fed was much clearer in his thought process and what he wanted to do out there – dictate, step in, finish at net. It worked like clockwork for the vast majority of the match. Back to Fed for a moment and I think he's played his first 4 matches perfectly – no long battles, no real grind it out displays and he should have plenty energy left for the Quarter Finals and beyond. As a fan you cannot ask for more and the most pleasing thing is from a body language / facial expression point of view he is looking sharp too. It doesn't really matter what I, McEnroe, or any pundits think about his game or what he should do in terms of strategy. As long as Fed is feeling confident in his game and ability to execute when he steps on court then he has a chance of winning any match no matter who the opponent. Now onto the big big upset as Nick Kyrgios took out Nadal in 4 sets with a stunning performance. This guy was unreal throughout and probably played some of the best service games I have ever seen. He played without fear and looked completely in the zone from start to finish. My last post looked at the need for a shot clock, but Nick Kyrgios has his own shot clock – he serves at his own speed (as per the rules) regardless of whether his opponent is trying to stall play. He didn't let Nadal intimidate him or let the unnecessary toilet break at the end of the first set disrupt him. A huge performance from the young Aussie and he looks like a more complete Mark Philippoussis. Looking forward to seeing more of him, he plays Raonic next. Next up is Stanimal who saw off Lopez in 3 sets. It will be the 3rd match Stan is playing in 3 days but he's done well to keep his court time to minimum so far. Lopez has been in great form so to dispatch him in straights is a very good performance. I guess we'll see if back to back matches have hurt Stan tomorrow but I think it only becomes a huge factor if they go 5 sets. Roger leads the H2H 13-2 but they've never met on grass before. Stan won their last encounter at Monte Carlo but I think Roger gets the win tomorrow. He's been looking very solid in his first 4 matches and it's time to reassert himself over his fellow countryman. Stan's been the undisputed Swiss Number 1 since his Australian Open win but I think it's Fed's turn to get back on top of things here. Keys for the match is Fed just serving well like he has done as well. Stan doesn't have the greatest grass game as he's not the best mover so he's going to have to blast winners off both wings consistently to have a chance. It's possible of course but I think Roger's variety will cause him problems. I expect a tie break or too so it will be up to Fed to test Stan's mental resolve in the tight moments by making him play one more ball and transitioning from defence into attack. Historically Roger often has a lull in slams when Nadal falls, almost like a weight off his shoulder so we might see his serve broken or a set dropped tomorrow but I think he gets the job done in 3 or 4 sets. Another serving clinic from the GOAT. Unbroken so far all tournament. Am i going to First Again? Yes!!! Winning return on tour! Great match by Roger. More thrilled by dull losing today. 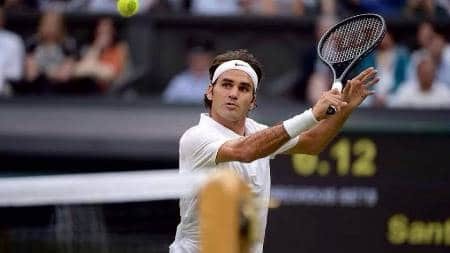 Hope Roger can keep the momemtum going to win his 8th Wimbledon. Agreed, beating Robredo was always on the cards but the Kyrgios win was a huge surprise. Nice play by Nick to take out Nadal…compare to Nadal’s celebration (after snatching 2nd set)..he did okay post match….. I think he will play a good match in the QF. Depends how well Stan serves. Yes I saw both! I had the best day ever at Winbledon! Watched Fed on Ct 1 who was so clean today, and very efficient, which is why his UFE count has been so low. He looks pretty damn focused out there’, conserving energy, and not giving Robredo any time. . He gave Robredo nothing today and the FH was fizzing all the way. And liked the way he knifed the slice and came over the BH return when needed was also to be noted. The atmosphere for Rafa/Krygios was just phenomenal , great match to be present at! Lucky lucky me!! And admirable to hold his nerve and Serve it out. His tactics were great, pulling Rafa out wide side to side, helped by a great serve! I am there tomorrow for Fed v Stan! Fingers crossed! Fed means business! Will you do a post so we can all relive your day??? Oh MY Susie, you ARE the lucky one! You are so lucky Susie. Congratulations! I have never been to a real atp tournament or seen fed play. I go every year to winnetka, a challenger 20 minutes away from my house. It’s tommorrow! The biggest star I saw play was James Blake in 2011. He’s an awesome dude! Down to earth and friendly. I have his autograph somewhere. He won the tournament of course. Im trying to go to the u.s open this year. Anyway. Im sooo jealous of you Susie! Definitely got a bright future ahead- someone in Australian tennis needs to step up after Tomic flopped. And Susie what a lucky lucky lady! Have fun tomorrow- would love a post on today as well if you could fit it in to your schedule. Susie was in the Royal Box today. Did anyone see her? Been so busy lately, could barely read the posts, couldn’t write any since Monte carlo but today is a special day!!!! Roger revenge for 1, then beautiful Nick……….. oh Nick…..
Been looking up to him (and Kokkinakis) a bit before the aussie open, during davis cup too… Great guy… And for those who didn’t know yet is a big Roger fan and he even spent a week training with him around Madrid! And stepping on the course today he must have thought today it’s my chance to beat him, and he did justice to his master!!!! Yoohoo!!!!! Ok i read the post now!!!!! What a day! Hey Nath, I am also becoming his fan. Ever since I saw him at AO where he lost to Paire but made life difficult for him. Wow, what a game and personally… what an ADULT. Nole and Rafa could both learn from him. The way he celebrated the winning of the third set or of the match. Would Rafa ever celebrate so normally?? I like Nole, then I don’t like him, then I like him, then I don’t like him. I can love him to pieces or the guy can bug the hell out of me. Whenever I think, oh Nole, I really like you… he does that thing that makes me dislike him instantly, like the way he “celebrated” matchpoint with that schmuckface against Jo Willy. Yeah very composed on the court for his age- Nadal and Novak both been quite emotional about their wins. Djoker went over the top after he beat Tsonga, hungry for a slam but this was too much. Hey Alysha, I still cannot see Nole making the final. And if he does… losing it to anyone. Except ofcourse to Roger. Nole knows how to lose to anyone on the tour except Roger, than he suddenly remembers he is “Nole 2011″…. Sorry, my believe in Nole took a dive when he lost to Rafa at RG 2014…. Not completely his fault, but…..
Ofcourse Roger is not there yet…. 3 very dangerous matches to go. 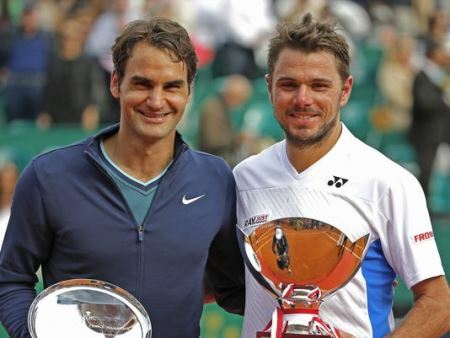 Please Roger, no friendship on the court with Stan, he is your opponent, beat him…. fast please. Yeah looks like Kyrgios and Kokkinakis are the future and Tomic won’t be the future GOAT. I think NOW we will see why the MC final was so important. Roger and Stan were for the first time in a final and they were both nervous. Now that is out of the way…. no more Mr Nice Guy. No more friends until the match is over. Roger is playing so well, he is NOT letting this one go. Might go to 4 or 5, but Roger WILL win. He is on a mission for 8th Wimby, not to get far in the tour, but to WIN the title. Nothing to talk about Roger’s match. Hats off to Kyrgios. Brilliant performance. Although he couldn’t have done this if Nadal was not injured. Hm, not sure about that one. What was Nadal’s injury exactly? Was it taking bathroom breaks after he loses the first set? Hope you are kidding! Nadal was injured AGAIN? 🙂 🙂 HaHaHa… Nadal has never lost a match without a serious injury. Nobody in this globe can beat him if he is 100% fit. Anyway, very good match from Roger, still have Stan at QF, Raonic/Kyrgios for SF, and I don’t know who, perhaps Murray/Nole if he go to Final. But as Roger always say, one match at a time. Today was bad luck for Nadal he ran into a younger opponent who was hitting so freely, no? I don’t think this counts as a loss. Wimbledon made a big mistake with this match up. Now, who is going to buy all those tickets in the Raonic-Kyrgios match? Who are these two guys anyways? I haven’t heard of them, have you? Half the stadium will be empty. You should write his presser scripts from now on. I can’t agree with you more on your post Jonathan! You’re blog is amazing! And I love what you said about Kyrgios, totally agree with you, great inside of what just happened… I’m still shaking from this delightful moment!!!!! I slept happy after watching Roger got his revenge with Robredo and woke up happier reading the news that Nadull is gone! Aussie Aussie Aussie Oi Oi Oi!!!!!! Great to see Roger so imperious. Wish the 1st serve % weren’t falling, but hopefully this is just a dip; he’ll need his serve against Stan. And as you say Jonathan, can’t be too bad if he still hasn’t been broken. He should have won in Monte Carlo; hopefully that loss will give him some added incentive to bring it home tomorrow. Plus he has the surface advantage here. I was glad to see that his points on return were not just due to Robredo going wide/long or into the net, but often from his own outright winners. That Kyrgios/Nadal match sounds unreal, have to go find some highlights! It was unreal! Nick was just zoned in the whole match! Never dropped his head ever panicked! Very impressive serving it out! Can’t wait til tomorrow! No fear from the Aussie. Shane Warne was loving it. Now where’s Pablo when you want him here!!!! Gaurav, please don’t wake up the troll. He is probably finding it hard to deal with the fact that for the first time since 1992, a player outside the top 100 (144 to be precise) has beaten a World No. 1, on Center Court, at the holiest of tennis places. Not to mention losing here for three years in a row, in 2R, 1R, and 4R isn’t exactly helping his GOATistics, or GOATfolio, depending on how you look at it. Let’s hope Roger doesn’t falter, or the troll will make a pompous return. P.S. Anyone notice Kyrgios has Greek roots? A certain Pete Sampras also had Greek roots. Just saying! Yup, he’s Greek Malaysian Australian! And the funny thing is that the crowd were rooting for Kyrgios throughout the match!! I would have understood a crowd cheering the underdog in the first set, just so that they get their money’s worth. But they were all for the 19 year old Aussie even when Nadal was on the verge of losing. That’s usually when the crowd gets behind ‘their man’ or at the very least, get behind the guy who’s losing (in this case Nadal at the end of the 4th) again, so they can see a decider. But nope, they were all rooting for the Aussie. The difference in the applause was remarkable. This is why it’s great being a Fedfan. The crowd is never against him. Even when he plays in his opponent’s back yard. At Cincy 2013 Roger got the crowd more behind him than Rafa. At RG 2014 Roger again got the crowd way way way more behind him than Gulbis. Ps Gaurav: Did you notice the camera’s did not show the Great Uncle Toni a lot from the third set on? I think I haven’t even seen a shot of him in the 4th set. But more importantly….. who will JMac gush over now??? Yeah they should have equalised for sure. USA were a bit unlucky. Thanks for the review. Excellent as usual. I am so happy I found your blog. Never saw the match but saw Dull at the start of the second set. Great day Jonathan! He and Screamapova OUT. Nick played like a man on a mission. Woohoo, hurrah, hurrah, Dull is out. Now if only someone could take out John McEnroe. Has anyone seen Pablo Jonathan? Yes. The last time I saw him, he was hiding under Dull’s pants! Welcome home USMNT. Great job Juergen, putting together such an awesome Klinsmannschaft. Belgium is legit! Might beat Argentina too! Good tournament for USA. They will win the world cup before England do for sure. Didn’t see any of Roger’s match, unfortunately (I set the recorder to BBC1, thinking that the powers that be would surely think that Roger vs. another seed would be a better match than Nadal steamrolling some WC. Ahem 🙂 ), but I was listening to it on the radio. Seemed good, apart from that last game, where he wobbled when serving it out – again. He *really* has got to do something about that if he wants to get any further – plus raise his level according to the quality of his opponents. Plus he needs to keep his eyes focused on Stan, and not start looking beyond that until he gets there, assuming he does. I was really glad he’d ended up playing before Nadal, because otherwise I think that could have been a real distraction and thrown him off his game. As Jonathan says, he needs to be alert for the post-Nadal lull – Stakhovsky, Benneteau, anyone? As for Kyrgios, well, what can you say? I’ve been keeping an eye on him via livescores all season, and was disappointed when he didn’t make much headway at the AO. Now, when he beat Gasquet the other day, I only saw that selection of match points saved, and just assumed that Gasquet had choked, but clearly it was more than just that. But today was hugely impressive: his coolness and maturity, and particularly his brain, were uncommonly good for someone who’s not yet out of his teens. Kudos to him. And, from Nath’s NZ link “Sunday’s match was more than likely the first of many between the pair [Raonic and Kyrgios] in the coming years.” Clearly. I wonder who’ll win this one? Oh yes, what you said, Alison, about the last-game wobble; what’s that all about do you suppose? It’s crazy how Nadal plays on his mind even when Nadal isn’t in the tournament. However, those lulls came after R2 and R1 in the past two years. This time he is playing the QF. I don’t think the Nadal effect will matter. If he loses to Stan, it will be for one of two reasons, a) A horrendous serving day, with break points being laid to waste, b) Or a surprisingly awesome display from Stan. The former much more likely, though I’m thinking positive. That last game was shaky. I can’t remember the last time I saw him make a bad toss. The toss did seem to be a little too much to his right, so it was a good idea not to sort of side arm it. I’m going to make a call. Raonic will beat Kyrgios, now that I’ve seen Kyrgios play. They both have very big serves, big first chance forehands, and a high strike zone. The texture will be different. Raonic will prevail. Raonic’s return game is pretty weak though whereas Kyrgios battered Nadal in that area so yeah could come down to the serve but I’d take Kyrgios to edge it out. When the draw came out I was adamant that making at least the quarters would be pretty reasonable and satisfactory but things have changed now. Fed was looking solid in the match against Robredo but there’s still a few kinks I guess that need working out. I have to sort of disagree about the forehand Jonathan, Fed was overhitting a lot with FH yday and it seemed the BH was way more reliable in a rally, he was missing some pretty easy FH so will see how that shot progresses in the QF against Stan- also another mini battle to serve it out. This is getting pretty routing now and I’m not loving it, Fed can’t get tight in those moments within the match, as he’s facing more quality opponents that’s only going to hurt him mentally. Other than that, it’s been 4 great rounds of tennis from him overall and he can move into the final stages of this slam well knowing that he’s disposed of his opponents pretty easily and can focus solely on the task at hand. Also what the hell was with that Robredo smash in the early sets, did he take his tips of Novak? worst overhead of the season. So I have to apologise to Kyrgios for underestimating him against Nadal. Taking Rafa out in the second week of a slam other than the final hasn’t been done in a very long time. His serving is immense and Nadal couldn’t read it whatsoever. I thought Nadal had him after winning the second set but he wouldn’t back down and the players who aren’t intimidated against Rafa and have no mental scarring from him are the ones that truly trouble him. It’s been an absolute crazy run for him to get to the quarters and taking Nadal out in the process, I tip my hat to him. Australia is blowing up at the moment, you’d think he’d won the title if you hadn’t been following the tournament. Fed has a pretty excellent opportunity here though. On paper he should make the final and if Djoker/Murray can grind it out, even better. A bit off topic, an analysis of the crucial second set tiebreak between Nadal and Rosol. Scores shown in favor of Nadal. Changeover. Get a load of this. At around 13 seconds, Rosol starts walking away from this chair. Nadal sneaks over his shoulder and watches Rosol leave, and spends another 5 seconds near his chair. By 20 seconds, Rosol is ready to serve, waiting. Now, something very interesting happens. Nadal spends another 10 seconds returning one towel at the corner of the Ad court, and the other at the corner of the deuce court. Changeover. Nadal takes 43 seconds. Considering that Nadal wasted 15 seconds during the prior changeover with Rosol serving, this was outrageous! All said and done, during the tiebreak, Rosol took 16 seconds on an average, while Nadal averaged 26. That’s 6 seconds over the allowed limit, and 10 seconds more than his opponent, enough to win the crucial second set, and the match. When will tennis fans open their eyes to such blatantly shameless behavior from this thug of a 14 Slam winner? All players get tight serving out matches though. It is only natural. I thought his FH was pretty decent Alysha, he made some errors but they happen. Guess we see if Stan can test it. @Sid interesting analysis. No surprises though. Just saw Nadal-Kyrgios highlights. Not sure how Kyrgios made it, Nadal was ferocious (totally different from his performances against Rosol and Darcis). Lots of respect for the Aussie! Kyrgios played without fear. Plus served exceptionally well. Just going through some reaction tweets and I came across Daren Cahill who said that if a player takes a MTO in the middle of a game or I guess in a critical stage of match, the player must forfeit the game. I think this is due to what Lisicki pulled in her match but once again the rules are being abused- this should also apply to bathroom breaks. What do we think? As for MTO’s, yes, a game must be charged. If you are not fit enough to play, you pay. Sorry. That combined with charging a point for serve delay, either on your own or your opponent, with penalties increasing for repeat offenses, should clean the sport, and prevent cheaters from stealing trophies. With that rule in place, Nadal would’ve lost the second set tiebreak to Rosol 0-7! And while they are at it, please, for Christ’s sake, do something about grunting/shrieking. Alize Cornet is also a big Rafa fan. I am sooooo glad that the Female Rafa is out. Like Serena or not, but she is the only one who can stop that screaming Sharapova. And when Serena went out, with no Li Na, no Aga, no Vika, I thought, oh my God, there we go again. Miss Gamesmenship will win it. Thank God she is out. She got owned by Halep today. I heard about her MTO in last match, when break point down. Pretty poor form. I saw the match and Federer was very focus as usual. It’s an amazing that Federer is still adding some more records in his legacy. Like you mentioned he reached the quarterfinal without dropping serve is an amazing record which has not been achieved in Wimbledon. Also I think he better the record for most Quarterfinals appearance by braking Jimmy connors record. Woow man. That’s quite something. Now I hope he wins his record 8th Wimbledon title this time. Yeah he’s setting or breaking records virtually every time he steps on court. Wow!! Couldn’t have asked for a better tuesday… Federer was clinical & simply amazing display by Kyrgios. The word that stands out is ‘courageous’ and although Rosol was also courageous, I think Kyrgios has more ability, and at 19, only sky is the limit. Let’s hope he does not get carried away. Nadal had just won the 2nd set and then held serve at love or 15 (very quick hold). Kyrgios took the balls and was ready to serve, meanwhile, Nadal, despite the quick service game was busy doing his routines, he wiped his face and hands with towel and slowly moved to take the return position. As soon as he looked up, Kyrgios who was ready, fired a wide serve which Nadal could barely touch.. The look on Nadal’s face was 1 of disbelief. Kyrgios was playing the match pretty much on his own terms! I believe Nadal raised his racket, ask Kyrgios to wait, but Kyrgios didn’t bother to wait. Even the commentator was comment on that. This boy taking control of his own serve! Kyrgios knows the rules. You play to the servers speed. I liked him, he was fearless. There is a school of thought across several comment boards in various sites that stan is looking good and may take out fed in 4. I disagree. The match is wholly on fed’s racket. The matchup does not favor wawrinka. If fed serves as well as he has been serving in the first four rounds, he will take stan to the woodshed. Wait. He is taking stan to the woodshed today and that my friends is not a prediction. Its a spoiler. It could be close but I make Fed favourite. Stan will need to play at a very high level if Roger’s game clicks. Superb summary, Jonathan. For today’s match with Stan, I just wish that Roger kicks this ‘friend’ stuff out of his head and stays very focused to move Stan from side to side as well as approach to net. Let Stan come up with perfect passing shots every time and all the time. Roger should take Stan down in straight sets. Yet, clearly potential danger is there. Yeah Stan doesn’t have the best passing shots so he should definitely come in when he has chance. WTF ? Serena looked like s**t she couldn’t even reach the ball or even hit it over the net. I wonder what was wrong? Was she ill or something? Why didn’t she pull out in the first place and just got humiliated like that ? She has a viral infection. But that nonsense with the serve was clearly being put on for the crowd. You can spot a faker a mile off and she was milking it. Kyrgios is half malaysian (from his mother), is he becoming a new superstar there? Yeah good point Dippy about Fed playing bad when Dull loses. See if he can break the habit. Perhaps the take away from this match (at least for me) was that Roger improves with the opponent. Robredo (dull as he is) is the best player he has faced so far. He did have a few chances but Roger kinda stepped up to the plate and took care of business when it mattered. That is a very important quality as well. If he can take Wawrinka then there might be no stopping him. It would be nice if we next year would associate the 19 in SW19 with the number of GS that Roger has won but if he feels he is OK by making #19 this year, I’m ok with it too. Yeah Robredo has been the best player he’s faced so far. Stan will be another step up. I’m backing Fed. He is playing some good stuff. Hahah. So much tension between them. I like how they fist pump off unforced errors. Murray down 2-0, Dimitrov playing like a boss. Cilic making it 1-1 against Novak. Suddenely Wimbledon seems a whole lot open. And Cilic is 1 set all with Nole, and already have a break in 3rd set. A set down. Still Roger is so flat, a bit slow, not looking good. Phew, what a nerve-racking TB. Don’t understand why Roger struggles with Stan’s serves. His returns were just not of his usual high standard. Roger also struggles with his own slices – so high on many occasions. It is time to step up. Allez Roger! Phew, the 3rd set was slightly better but still pretty tense. Roger should not be fooled by Stan’s niggle and please stay fully focused. Should not let double BP go away easily in the fourth set, if comes around. I hope Roger wins this. Big big shot for him as I think his hardest possible rivals were Nadal and Murray. Don’t see Dimitrov beating him and I have a lot of doubts with the Djoker. Federer big favourite. The bookmakers say different and they have to balance the books. I make Fed 2nd favourite currently. Poll question. Who would you want Roger to play in the SF? Kyrgios? Or Raonic? Any why? Raonic. You can expect what you gonna find. With Kyrgios you don’t really know, he is more unpredictable. Kyrgios because I am curious how is it going to be. He has more potential and not just depending on his serve. Kyrgios. I want Roger to show Dopal how it is done. So so glad. Wow. Stan was tired I think as things wore on but Roger really held his mettle. Awesome w/UFE ratio. Gotta give credit to the old man that he’s still competitive with these kids. Do you all think he won it more or less than he just survived Stan’s stanima? We shoud say also that circunstance are helping him. He got a relly easy path to the QF to face a tired guy who is not a very good grass court player. Yeah. Absolutely. Stan’s a crap grass court player. With a serve that clocks 130mph and shots of both wings that barely leave a trace on the court. Totally. He had a decent draw up until the 5th round. Had the toughest of the quarters. Not his fault that your king of clay copped it on grass. Don’t think Stan has ever beaten anyone inside top 10 on grass. So he doesn’t have a great pedigree. However he was the toughest QF opponent on paper in terms of ranking. Cilic and Dimitrov no pushovers though as we saw. Fed won because he hung tough and got better as the match went on. Stan looks great for the first 2sets, but Federer also playing good on that sets. All stat for the first two set is tight, but Federer was not good at BP conv. After losing 2nd set, Stan is declining while Federer getting on fire. Anyway, as you said, glad Fed can win this, and go to SF. Fed played a clean match. Hit a great 2nd serve and volley on set point in the tie break. I’m struggling to warm to Raonic – very clinical in appearance and game style. Pablo/KoC – agree with you thty Stan historically is not a great grass court, but in think he is really a new player these last two years everywhere – so im not sure grass is that different for him then the other surfaces in terms of his growth – he is a late bloomer who has matured on every court. But I agree circumstances did help Fed today. Of course then you have to be good enough to be able to take advantage of those opportunities when they come. And Sid – what did Raonic do? I think Stan might have a good USO if he strikes the ball well.